This is perhaps the oldest of the distinctive American Breeds, being mentioned in the earliest poultry books as an indigenous and valued layer, very hardy and good for the table. Despite extensive research by members of The Dominique Club of America, the origin of Dominiques, as a distinct breed from the general poultry population in the late eighteenth century, remains unknown. There may have been two separate origins. 1.) There was an early Dominique Club at Salem, Massachusetts circa 1827, which presumably held informal shows of a similar type to those held then in England for Sebright Bantams, Spanish, Yorkshire Pheasants and Lancashire Moonies (both Hamburgh ancestors). As many of the people in Salem were of British origin, and tending towards puritanism, imported Scots Grey fowls probably played a part in developing their version of Dominiques. 2.) In the very different popular culture of the Southern states, the name ‘Dominique’ was applied to Game fowl of Barred, Cuckoo or Crele plumage colour varieties in 1830. 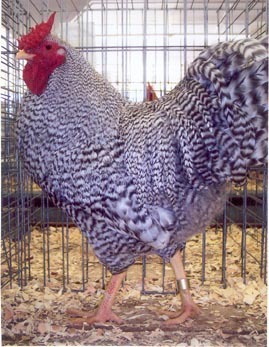 Therefore one can assume that the Southern strains of the Dominique breed were crosses between these varieties of Game fowl crossed with general farm hens. Dominiques were exhibited by only four people, when the first general poultry show was held in the US on 15-16 November 1849 in Boston, Massachusetts. They were seen at shows in Britain as early as 1870. However, the breed gradually declined from say, 1927 and they only survived because of the determination of three fanciers. In 1970, when a new generation of enthusiasts came along, the breed’s popularity increased again. The only other country where Dominiques have been bred for a long time and in reasonable numbers is Germany. At the present time (2012) a neutral observer might think US strains of Dominiques are ‘Wyandotty’, meaning large and a bit heavy and lacking in length of tail. On the other hand, German ‘Dominikaners’ have perhaps gone too far the other way. They tend to be too small, and although they have nice long tails, the tail is long, straight, and carried low, similar too Sumatras. Since 2000, some British fanciers have imported both types and crossed them, resulting in some very fine birds of medium size, with a large, high and fanned tail – just like the old 19th century pictures. Dominique Bantams have been bred several times by American, British and German fanciers, but they still remain rare everywhere.